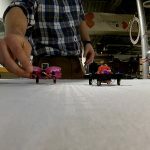 Readers of this site are probably familiar with drone race events such as the world championships and various national competitions. Only a few incredibly skilled pilots are able to compete. 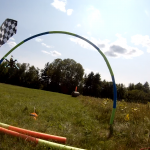 Fortunately, you don’t have have to be a top-tier pilot to enjoy competitive FPV racing. Our own local communities can provide everyone with access to this exciting sport—and racing as part of a local community is some of the most fun you can have with the hobby. If you’re not yet racing in your area but are ready to get started, this is the guide for you. If you’re already racing, hopefully you can learn from our experience and improve your own events. This guide is geared toward running small, local races that provide structured competition as a means to improve—without ever losing sight of building and enjoying a friendly and inclusive community. In part 1, I’ll explore what’s needed to get a community group organized and ready for race events. In part 2, we’ll discuss what’s needed for each event on race day. 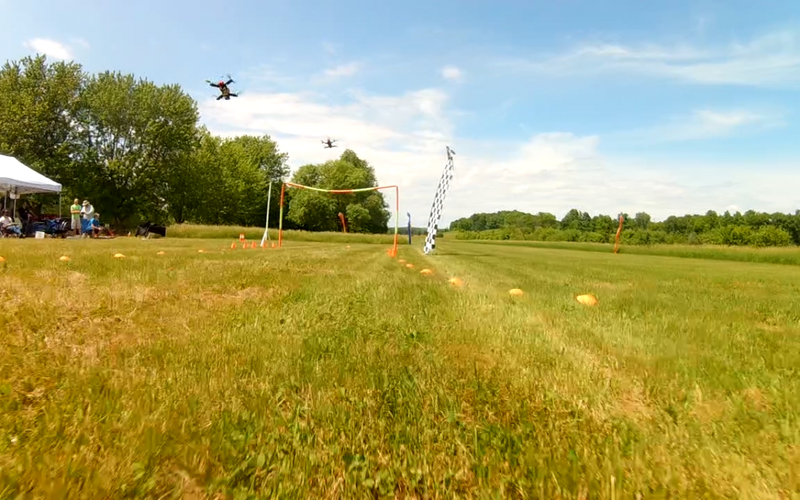 The first step in creating a drone race: finding pilots! A successful race starts with a group of interested people. That’s not the focus of this article, but it’s pretty likely that this kind of group exists in your area already. Find it! Search Facebook and Meetup for like-minded groups and individuals. Your local AMA chapter may have a group you can draw interest from. If someone is trying to set something up already, offer to help them or have them help you. Once you know there’s enough interest to pull together a small event, just get started! Don’t wait for someone else to organize your event; take the initiative and start making plans. This may be difficult to begin with, but the more you plan and schedule, the more likely others will get involved and help you. Scheduling and publishing events ahead of time allows potential racers to tell their friends, which increases numbers over time for later events. You’ll start small and work up, which can be a good thing. A good place to start planning your race is finding a suitable location. On the surface, this seems easy because you can theoretically fly almost anywhere. In practice, there are a number of important considerations to be made including safety, permission, and suitability. Your first concern should always be safety. To race safely, you need exclusive access to the area you’re using. Between heats, your course will look mostly like open space—a great place to picnic, let your dog run around, or go for a hike. These will be immediate problems for your races, so you must reserve your space ahead of time to prevent it. You’ll need to be able to tell people to stay off your course, and may need to clearly mark and post signage that it’s currently in use. You also need to look for locations that offer a buffer area from potential hazards. You don’t want crashes into buildings, roadways, power lines, or areas that people are using. Use common sense, and if there’s any doubt, err on the side of safety. Many places that frequently reserve space like school athletic fields and public parks will require proof of insurance for your event. This kind of insurance can be purchased but is sometimes only available to sponsoring businesses or legally organized groups. You’ll definitely want to check in with any existing model clubs or enthusiasts in your area. AMA fields may be open to hosting your event, but might require membership for all participants. If you are all already AMA members, that could help with getting proof of insurance usable at other sites. Non-traditional locations may be open to use of their space with less formality. 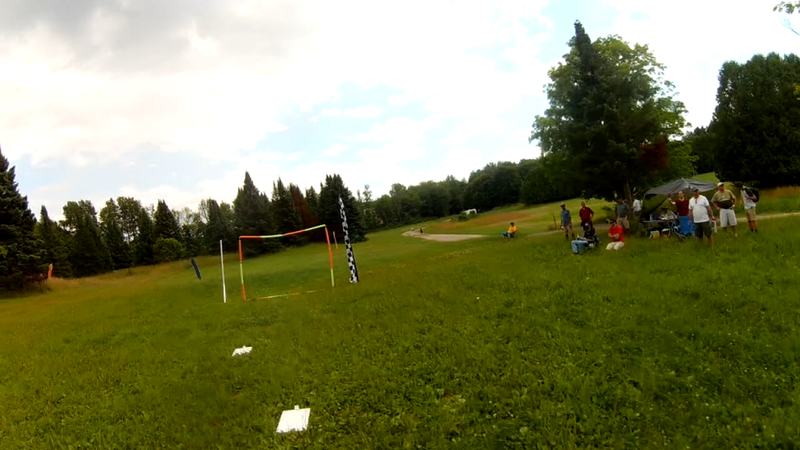 I’ve raced at a gravel ski resort parking lot in the off-season, a private airstrip, the front lawn of an inn, and an outdoor soccer field complex. Private landowners can open up space at their own discretion; some of these locations did require waivers. Use your connections and ask around. If your location is within 5 miles of an airport, call ahead before you publish your event. Be friendly and forthcoming with details. Setting up a 50’ or 100’ AGL ceiling for your event can help. By being courteous and respectful of the shared airspace, our group hasn’t had any problem with this while setting up events. Now you can start thinking like a pilot and a race participant! Where would you like to fly, and what would be a problem for you? Soft ground surfaces like grass and dirt are better than rocks and pavement. Avoid tall grass, though—inevitably someone will crash there and you’ll lose half an hour looking for their quad. If there’s water nearby, somebody will end up in that, too—steer clear if you can. 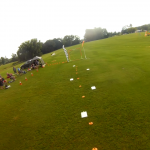 Look for interesting features to integrate into your course: hills and height changes are a plus, and trees offer natural course markers and obstacles. Your ideal location may also have amenities like picnic shelters, tables, benches, restrooms, water fountains, and power outlets. Finding and securing good locations is usually a slow process, so start early and reach out to everyone you can to help discover them. Once you have a few, you can keep a shortlist and expand when opportunities present themselves. If all you can get to begin with is a flat field in the middle of nowhere, don’t let that stop you. You can still make it work. I won this race at a private airstrip by just 0.2s. You can’t experience that kind of rush by flying alone. Everyone will need to know up front how you plan to structure your competition, and there are a lot of different ways to set this up. You can take a “time trial” approach and record each racer flying solo—but we think a race should be a social event. There’s nothing quite like having multiple pilots flying concurrently! You won’t experience chasing down a rival or watch a glorious photo-finish with a time trial. Being in the air at the same time as others is one of the most rewarding ways to experience the hobby, and it’s the reason many of our local pilots race. There are definitely some added challenges with concurrent races. On the organizational side, you have to set up heats, do frequency management, and keep pilots organized. For a first event, we’d recommend not having more than 4 racers in the air at once. You’ll also have to consider a scoring method. One option is a point system for races won or laps completed. Another option is an elimination-style bracket. Our group does live timing and compares the total race time of each racer to determine final standings. Experiment and find what works for your group. If you have a timing system, you’ll increase the options available to you. One of those “boring but important” details to setting up a race event are your race regulations. You or your competitors may view regulations as unnecessary overhead, but they provide a framework that is extremely useful in defusing difficult situations that could arise. Regulations can limit your liability and help prove you’re going about things safely—that helps to open more race locations to you. If you have a good group, pilots will self-police and you may never need to reference the regulations during the event. Good regulations cover basic safety concerns and what you expect from pilots. Racers are expected to have airworthy quads, exercise proper battery handling, fly only at designated times and locations, etc. They also outline race procedures and the specifics of any penalties. Our regulations include a statement where each pilot takes responsibility for their own behavior and the equipment they bring. You can write your own, but it’s easiest to start from something like the WRSA. We started from a previous version of these and simplified them to better fit our community. Having written regulations is especially important if you plan on offering prizes or if you plan on joining the race yourself. We’ve had to disqualify pilots at times, and it looks dishonest if there isn’t a specific written regulation to point to. As a side note here, unless there’s a safety concern, we never tell someone they’re not allowed to race with us. Being disqualified in our events simply means that pilot won’t be listed in the standings or eligible for any prizes. It keeps the local community spirit intact for all, but the serious racers don’t feel unfairly treated. One of the most important and visible parts of your regulations will be setting race classes. 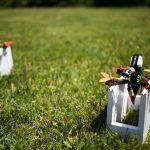 You can just follow the WRSA, MultiGP, or any others you like—but keep in mind that the class structure defines your race more directly than any other regulation. There are lots of attributes you can use to designate classes: size, weight, battery type, prop size, prop pitch, number of prop blades, number of motors, motor angle… the list goes on. The key in community racing is to regulate as little as necessary to get the kind of racing you’re looking for. Open class racing uses a liberal approach which allows most equipment to qualify. This is great for pilots who have already invested before knowing the class structure and those that want to use what they like best. Lots of equipment qualifies so the barrier to participate is pretty low. Because open-class racing is generally permissive, all kinds of “latest and greatest” parts can be used. This has the unfortunate effect of enabling racers to “buy” their way to higher positions buy purchasing ever-better equipment than their budget-conscious competitors. Spec racing is the opposite—it’s a tightened regulation without a lot of room to deviate. The obvious disadvantage is the cost of entry and loss of personal choice: you have to buy and fly the parts defines in the specification. This is where the advantage of spec-class lies: the parts you use are no longer defining your performance, so it’s pilot skill that wins the day. Over time, expenses are actually lower than for an open class because there’s no need to purchase newer, better parts to stay competitive. There’s a temptation to define a large number of classes because people own quads of many different sizes and capabilities. Every class adds more time to your event and splits your community into smaller groups rather than bringing people together. Adding classes also means many smaller, less competitive leaderboards. That’s why we’ve settled on just two classes: one spec and one open. Our open class is very permissive and basically only places upper size limits for safety. There are no minimums, which means basically anything people own can compete. We made a point to make sure the spec class craft weren’t excluded from our open class, so you can bring just one frame and fly in both. This field is unusable space for the landowner, but it’s perfect for short-course racing with elevation changes and a few trees. Registration is another item that might seem like a formality your community doesn’t need, but it’s really not difficult to set up and there are big benefits to doing it. Your registration form should be very easy to fill out and submit. An online service can make quick work of this; we use Google Forms for our own. The questions you ask should be as simple as possible and only as many as absolutely necessary. Name and e-mail address are obvious requirements. You’ll want to know what classes they’ll participate in so you can set up the heat structure. Next, ask about what video frequencies each pilot can use. This is critically important to how smooth your event goes. Finally, add in a couple checkboxes requiring participants have read and agreed to the regulations. This last part protects you as the organizer, and may help you more easily secure a preferred location. Set a closing date for registration about 2 days before your race. You want to keep it open as long as possible, but leave enough time to process through the forms and send your racers accurate information the day before the race. The information you get from registrations is invaluable in setting up your heat structure and doing frequency management. Both of those topics will be covered as part of the next article. There will probably be some adjustments as you go, but most of the work in setting up your event structure only needs done once. You’ll create a library of useful tools and information you can draw from for every event going forward. Save this information to re-use for every race, and share it with others who want to collaborate with you on organizing races. With this kind of foundation in place, you can focus on the details that make your race run smoothly, but also keep it fun and unique. In part 2, we’re going to explore those nuts and bolts of running a successful race day. This post was brought to you by our awesome guest pilot Michael Niggel! Michael is working on his second full season directing regional community races and has served as Race Director for the past two years at the Champlain Mini Maker Faire. 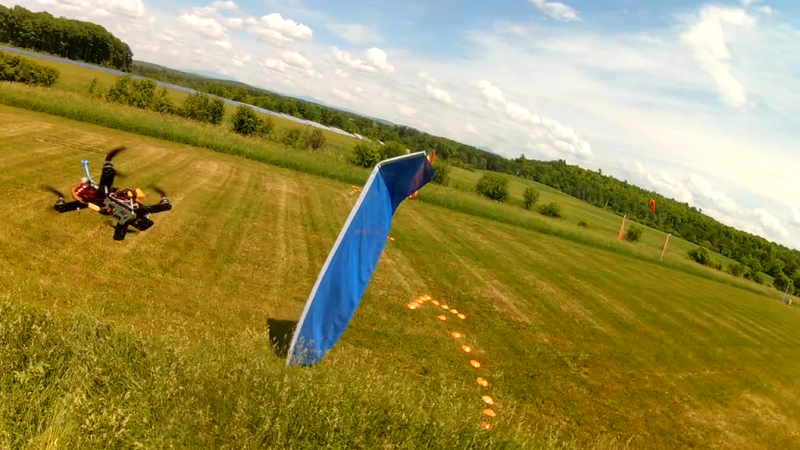 You can check out some of his flying footage here!